If you are experiencing problems with a database on your account, you can check your databases for errors. Under Modify Databases, use the Check Database drop-down menu to select the database you want to check. Once you have selected the database, click Check Database. A new interface will appear, and the system will check whether the database functions correctly. If the Success: Check Complete message displays, the database functions properly. 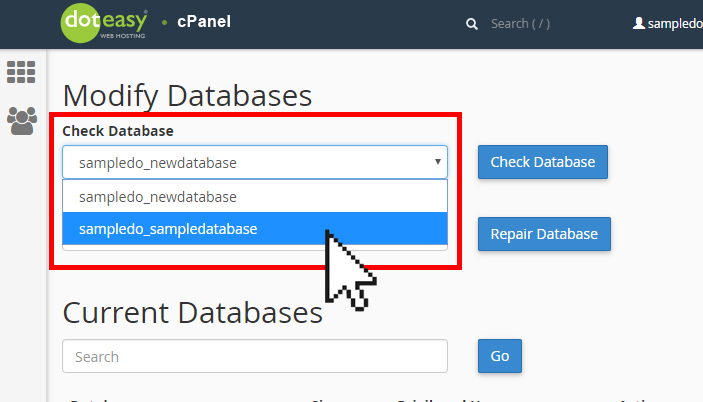 Under Modify Databases, use the Repair Database drop-down menu to select the database you want to repair. Once you have selected the database, click Repair Database. A new interface will appear and the system will check and automatically repair all tables that require repairing. If the Success: Repair Complete message displays, the system successfully repaired the database.